1- Can you define Street Photography for us? 2- Does Street Photography have a future? In the past I have tried to explain the place of Street Photography within the documentary tradition, I have talked about Street Photography as an approach, an attitude rather than a place where the pictures are made, I’ve talked about the minimal equipment required to shoot on the streets and the lack of interaction between the photographer and subject. To the second question I have talked about society and culture continually changing and therefore the subject matter of Street Photography continually being renewed and refreshed and relevant. Finally I have arrived at the realisation that I have been coming at these questions from completely the wrong angle, I have been playing the interviewers game, I have been going along with the notion that ‘Street Photography’ is a ring fenced region of some greater province known as ‘Photography’ the boundaries of which need to be demarcated with rules about its practice. Now it is absolutely clear to me that these questions themselves were flawed and the things I had talked about were indeed characteristics of Street Photography but they did not define it. Now I understand that ‘Street Photography’ is just ‘Photography’ in its simplest form, it is the medium itself, it is actually all the other forms of photography that need defining, landscape, fashion, portrait, reportage, art, advertising….these are all complicating additions to the medium of Photography, they are the areas that need to be defined, ring fenced and partitioned out of the medium of ‘Street Photography’. When a child picks up a camera and pushes the button that simple spontaneous image is a Street Photograph, it is, first of all, a raw reaction to the scene in front of it, a person, a car, a color. That primitive urge to react, to make a picture is at the heart of Street Photography beyond any other area of picture making, it comes before any other agenda. So we are all Street Photographers before we narrow our sights and impose conditions and rules on ourselves to become Portrait photographers, Fashion Photographers, Landscape Photographers, Art Photographers (whatever that really means) etc. Street Photography is Photography and so the second question is easily answered, the future of Street Photography is intrinsically tied to the future of the medium itself, while there is Photography there will be Street Photography because it is the Prime Mover, the evolutionary inheritance of all Photography. It is not a coincidence that the first ever photograph was a street scene, a simple candid view, the most basic form, it might be considered a landscape but it will always be firstly a Street Photograph, any other definitions will be subsequent and overlaid. As Street Photographers we need no longer explain ourselves, we need no longer wrangle over a form of words. It is for the rest of Photography to define itself, to explain what new and meritorious characteristics it has brought to Street Photography that make it different and worthy of note. An interesting observation. I can see where you’re coming from, but don’t all types of photography come down to just being ‘photography in their simplest form’? It’s a notion that can be applied anywhere. The various types of photography in the industry are given names in order to explain the area of specialism we photographers fall into. They are there to explain, not to define. We all know the best photographs come from pushing boundaries, not stopping at them. Boundaries are set by none other than photographers themselves, even if we don’t realise it. Well its an interesting article, Nick but the points made are difficult to agree with. To come to your conclusion you have devalued the definition to the point where it has no meaning. It is now a snapshot which any child could make. It is now some grand category into which all other categories fit. What nonsense. As a relative newcomer to street but not to some other categories of photography I have quickly learnt that street can be quite difficult, with lessons to be learned that other categories have not prepared one for. 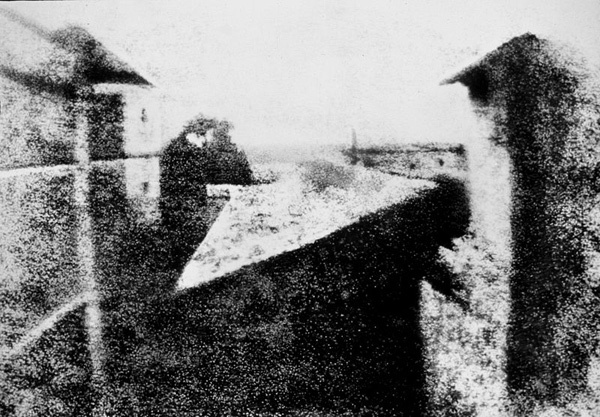 Why show the image by Nicephore Niepce taken in 1826. As the first ppernament image it is of great historical importance but street photography it is not. Its a very grainy image of a rooftop. I will leave it to others with a far greater understanding of the history of street to debate who is original pioneer of this genre but I am sure it is not Nicephore Niepce. At least in terms of documentary photography the Crimean War photographs of Roger Fenton might be a good starting point. Not at all, many are conceptually or technically elaborate and don’t emphasise the moment or the framing. They are much easier because the photographer hides behind filters, styling, post production and in the case of ‘art’ photography, words. Street Photography deals directly with Photography’s greatest trick, it is a simple one but extraordinarily hard to do well. Yes Dennis, a child could take a Street Photograph, of course, but probably not a very good one, Street Photography is a childishly simple form but to do it brilliantly is very nearly impossible. You have misread me, I don’t say that all forms of photography fit into the Category of Street Photography, I say that Street Photography as the most basic form is at the heart of all the other forms, they all add something conceptual or technical to what is the basic inspiration to make an image. When doing a portrait or making a landscape shot there is invariably a moment when the subject smiles or glances one way or the moon just clears a cliff top, you may be using soft boxes or a 10×8 camera on a tripod but that recognition of an optimum moment is at the heart of photography in its simplest form, it is also the very essence of Street Photography. “We are all Street Photographers”? I can understand your frustrations with always being confronted with the requirement to define street photography and I’m heartened to see you moving away from definitions that are constraining. However, in my experience (both personal and online) the need to define (and as a consequence or perhaps as the primary purpose) the need to exclude comes mostly from those who perceive themselves as street photographers. I have the impression that some street photographers have reacted to the snobbishness and elitism of the ‘fine art’ tradition by adopting a snobbish elitism of their own. That’s why I try to avoid the term ‘street photography’ – it has become too loaded a term and too exclusive a term. At Smugmug where my site is hosted they use the phrase ‘Street Scenes’ for one of their categories – this is what I use: it describes perfectly what I’m capturing without treading on the sensitive toes of some of street photography’s advocates. I should of course qualify this by noting that this is not a characteristic of you or of all street photographers – just some of the noisier ones and perhaps less confident ones. No, it was never a street photograph but simply where the camera was pointed to afford it light and shadow and yes these are familiar terms of both photography and ‘Street’ but nothing more. Street photography requires intent and therein is nearly everything. Street photography is not photography in its simplest form but put simply it requires all the complexities of the world and of the photographer. In simplifying the world you reduce it to …nothing. I’ve been a photographer all of my life but have had a camera for the last 2 years. Perhaps not a photographer: an observer. Now capturing those observations in digital format. I see fantastic images whilst driving, or over my daughters shoulder when we are sitting in a cafe, a couple embracing under a street lamp or any other million images that pass in front of my eyes on a daily basis. I’m drawn to “Street Photography” for this reason. I often ponder the possibility of having the neural camera that can be triggered by thought to capture these fleeting images as they happen. For these reasons I get where you are coming from. The natural instant attraction of the perfect scene flashing right in front of you and striving to get yourself into a position: physically, mentally and creatively to combine that instant reaction with the perfect, artistic and sociological representation of that moment in time. The art, composition, post-processing and interpretative dialogue comes after the initial primitive (or “childish”) instinct. So I think I understand, but let me know if I’m over-simplifying. Thanks for kicking off the thought process. Some Days Are Boring – Yes Matt, No Matt. As most of us observe the world around us in colour does your definition of street photography exclude monochrome images — the favourie of most street photographer. Or have I missed something? Philip, I agree with you, which is why I choose to work without a flash and in colour on the street. Colour wasn’t always available to us though which has given Street Photography a long heritage of b/w photographs by some very famous photographers. I think if you choose to work in b/w on the streets today in 2015 then you should be able to justify that choice in some way. Many people work in b/w because it is more pictorial, it’s easier by a long way to make aesthetic pictures once colour is removed…..I think it is lazy in this day and age.